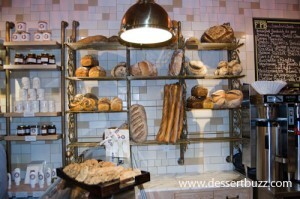 After the much-loved Payard patisserie and bistro closed last summer Francois Payard told DessertBuzz that he was planning an ambitious return to New York City with a large central kitchen on the Lower West Side and a number of Payard bakeries. 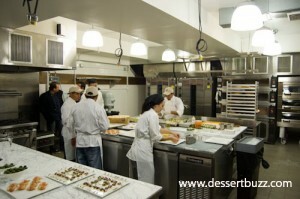 He also said he planned to open a more upscale Upper East Side location as well. 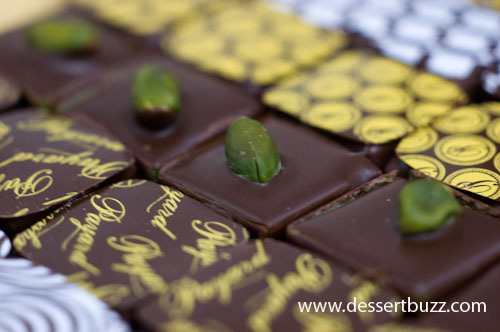 Meanwhile, we have had to make do with the small Francois Chocolate Bar outpost inside the Mauboussin jewerly store. 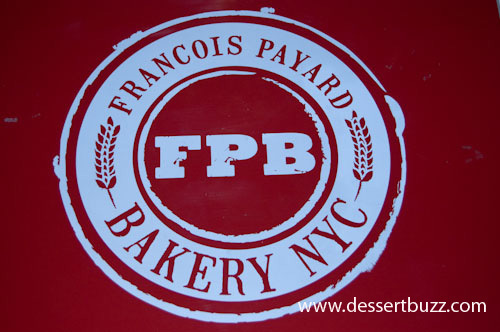 Now the wait for stage two of the Payard New York Empire is over as the first “FPB” – Francois Payard Bakery is set to open on September 21 at 116 West Houston Street. Last night Dessertbuzz was there for a preview party and tried to eat as many of the bakery items as possible. The customer space is very pleasant with 20 seats. It leans towards rustic with wooden signage and chairs and an open kitchen. The feel is the polar opposite to the colored plexiglass of Pinkberry or modern formica stylings of Starbucks. The huge open kitchen is many times the size of the bakery customer area. 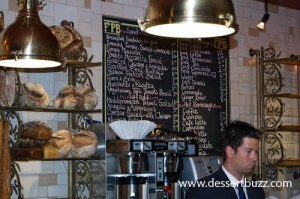 A blackboard details the days fresh baked menu. There are plenty of items you would expect to find at a French cafe or bakery like the croque monsieur and some more unusual items like Salmon on pretzel bread and the vegetarian-friendly tofu with tomato and basil. There are also plenty of nice gifts for the Payard fan. Such as FPB branded English Breakfast Tea, Pates, gourmet coffee, artisan jams, homemade chocolate spreads, givrettes, pretzels, fondues,biscotti, and pastry-scented candles, and of course lots of chocolate items. 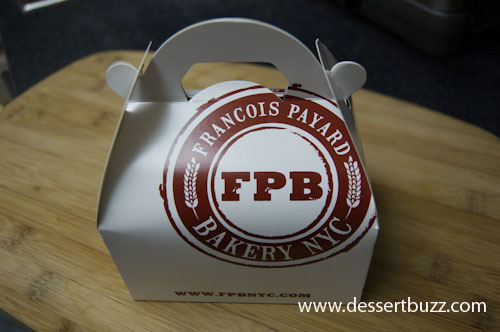 FPB baked items will include: Croissants, pains au chocolat,brioches, crème brûlée, cinnamon buns, seasonal muffins, orange blossom donuts, éclairs, cookies, large macarons, le gateau roulé,seasonal fruit tarts sold by the inch. Sandwiches: Breakfast sandwich du jour, croque monsieur, tomato and mozzarella panini, smoked salmon on pretzel bread, ham and brie, prosciutto and fresh ricotta, and vegetarian tofu with tomato and basil, etc. And don’t forget the macarons. 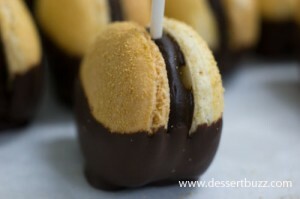 The S’mores macaron on a stick was my favorite but it is not planned to be a regualr offering. 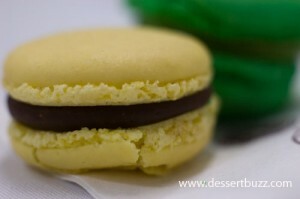 The Cola flavored macaron however will be available and that seemed to be a crowd pleaser. Look for more reviews of the pastries from FPB in the coming weeks. Read the interview with Francois Payard Part I and Part II. DessertBuzz video: Francois Payard speaks to DessertBuzz.com about the Du Japanais Verrine pastry. 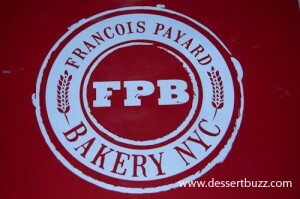 Francois Payard Bakery is located on 116 West Houston St. Cool! I’ll actually be in NYC right after it opens…. Now the hard part, will I be able to will myself to a Frenchie place in NYC….??? Not this place man – 1) he’s really French 2)his stuff is really good (and “Frenchy” too. 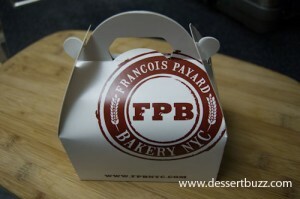 What’s with the Lower West Side?..Payard on West Houston St is in Greenwich Village. 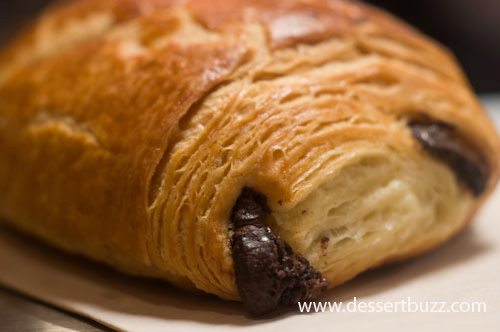 The City Sweet Tooth » Dessrt Buzz’s Payard Preview! Mimi, it’s an honor to have you post on Dessertbuzz. I was born and raised in Chelsea and went to grade school in the Village and for some reason consider everything from 34 down as the “Lower West Side” but yes the more accurate location would be Greenwich Village” or just “The Village”. Don’t miss KINGS OF PASTRY,a wonderful new feature-length documentary about the French pastry competition (Meilleurs Ouvriers de France or MOF), now playing at Film Forum,on West Houston,a few blocks West of the new Payard, through September 28. No need to check it because i know they were not did anything wrong yet.